LG Display is showing off a remarkable newspaper-sized flexible e-paper prototype. The e-paper display is 19 inches wide (250mm x 400mm). It is just 0.3 millimeters in thickness and the entire display weighs just 130 grams. Fans of Stephen Spielberg's 2002 movie Minority Report are gasping in amazement. 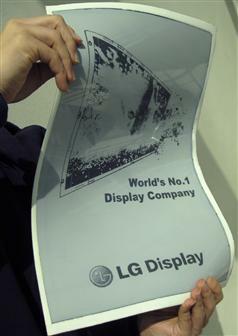 Compare LG Display's flexible e-paper newspaper with the fictional version shown in the 2002 movie Minority Report. She set up a screen: a television that unrolled like a poster. Another computer link, he guessed. She showed him pictures. Their vocabulary increased.